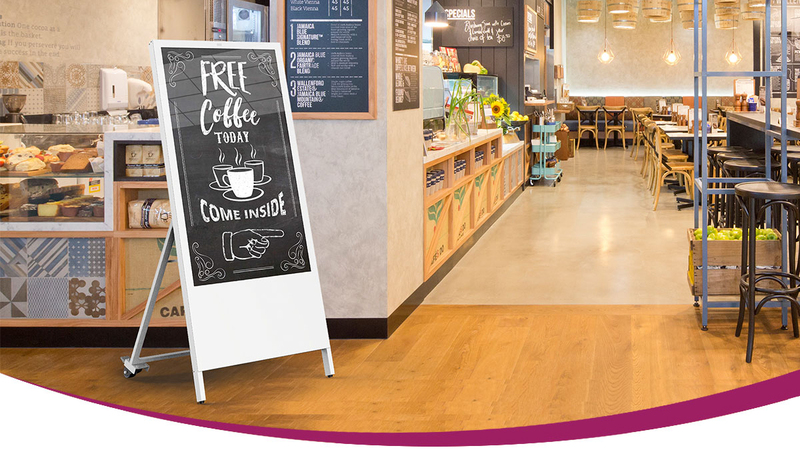 The integrated lithium-polymer battery revolutionises the way you can use Digital Signage. This commercial grade slimline battery solution gives you over 12 hours running time and can recharge fully in 7 hours. 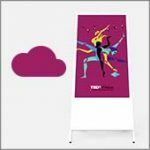 With a special 700cd/m2 IPS panel used in this display is up to three times brighter than a domestic display making it ideal for brightly lit public spaces such as shopping centres. 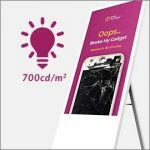 The display has a light sensor that automatically changes the screen’s brightness depending on the ambient light ensuring the most suitable brightness depending on the environment. 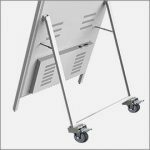 These freestanding displays are a fully portable solution and can be easily folded and moved by one person as they feature fixed castors. These wheels can be locked to prevent the screen from moving once in place. This is the most straightforward way to upload content to the screen. 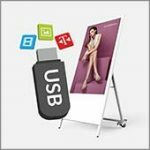 Simply load images and videos on a USB stick, insert in the display, wait for your content to copy over and then remove. Your images and videos will now play in a continuous loop. 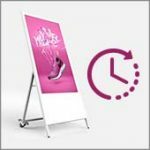 These displays come with free optional scheduling software for displaying different content at different times of the day. You can also display a “ticker tape” style scrolling text message along the bottom of the screen. For a small charge you can upgrade your screen to be networked, allowing you to connect your screen via Wi-Fi, LAN or 4G, then remotely update it over the internet. 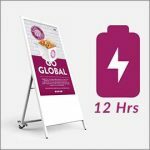 The new Digital Android Battery A-Boards are in stock now and available for immediate dispatch. For the latest prices and special offers please click “here” or give us a call on +44 (0)121 421 4458.